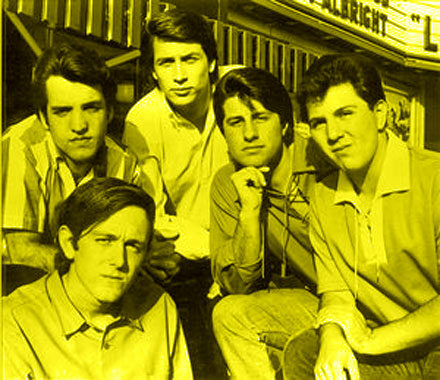 As the years have passed, and my appreciation for Brian Wilson and the Beach Boys has deepened, I have managed to dig some things not by the band themselves, but rather in their orbit. It doesn’t get much more orbital than the Sunrays, a Beach Boys-like band that got their break (they had two hits in 1965) because they were in the clutches of the Wilson brothers insane father, musical megalomaniac, Murray Wilson. 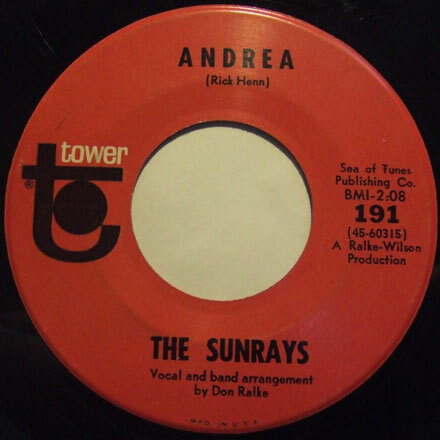 The Sunrays existed pre-Murray under a variety of names before he took them on, and got them a contract with Tower. They were interesting in that despite their association with Wilson, they wrote much of their own material (including today’s selection). Their first hit ‘I Live For the Sun’ (there’s a cool clip on Youtube of them doing the song on Shivaree) is a fine piece of imitation Beach Boys. The tune I bring you today – which actually did a little better on the charts edging the Top 40 in January of 1966 – is also one of the most schizo 45s I’ve ever heard. ‘Andrea’, written by drummer/singer Rick Henn starts out like a garage punk opera, with fuzz guitar, power chords and rolling drums, then immediately drops into Gary Lewis territory with a conventional and polished pop sound in the verse. The choruses, with the falsetto repetition of the title has a strikingly weird feel to it, like all of the pieces of a Beach Boys record are there, but somehow assembled incorrectly. Fortunately the end result, though odd at first listen, really grew on me (and hopefully you, too). Interestingly, in an interview he did with Ear Candy, group member Eddy Medora says that the band had a pretty good working relationship with Murray Wilson (maybe you had to be related to him to take out the glass eye and go nuts?). The Sunrays put out an album in 1966, and even contributed a song to the 1968 biker chick movie ‘The Hellcats’.